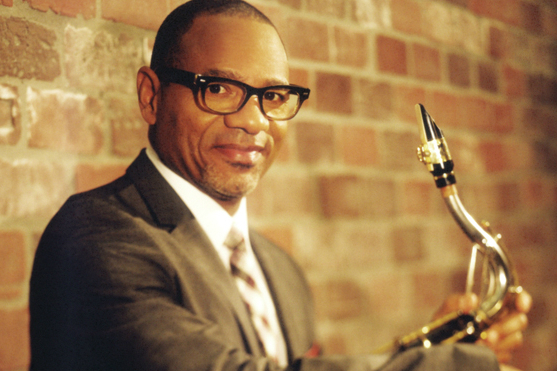 Saxophonist Kirk Whalum is bringing the Christmas edition of his "Gospel According to Jazz" show to St. Louis for a performance at 6:00 p.m. Sunday, December 13 at Friendly Temple Missionary Baptist Church, 5515 Dr Martin Luther King Dr. Joining Whalum (pictured) will be his brother, singer Kevin Whalum, along with saxophonist Gerald Albright, guitarist Norman Brown, singer Shelea, and keyboardist and singer John Stoddart, plus Tiffany Mosley, Leslie Johnson, Darius Bradford, the Friendly Temple Missionary Baptist Church Mass Choir, and the R.F. Specials Choirs. The Memphis-based saxophonist, who's the nephew of St. Louis pianist, saxophonist and singer Hugh "Peanuts" Whalum, brought the "Gospel According to Jazz" to St. Louis previously in December, 2012, also at Friendly Temple. His most recent album, the fourth volume in the "Gospel According to Jazz" series, came out in 2014. Whalum and Albright's "Sax for Stax" tour also stopped at The Pageant back in the summer of 2009. Tickets for the 2015 "Gospel According to Jazz" Christmas show are $20 for balcony seats, $30 for floor seats, and $55 for VIP seating, and are on sale now via the Friendly Temple website and by phone at 314-367-9700.